CANDYMAN -- It's time to spill the beans in CANDYMAN, a documentary recounting the amazing true story of David Klein, an eccentric candy inventor from LA who came up with the concept of Jelly Belly jellybeans. These colorful beans became a pop culture phenomenon, revolutionized the candy industry and were personally endorsed by Ronald Reagen. However, David's eccentric personality and peculiar sense of business led him to leave Jelly Belly just as it was about to explode and grow into a billion dollar enterprise. Is there room for eccentric genius in the modern corporate world? The film tells how Klein may have lost his beans, but kept his soul. 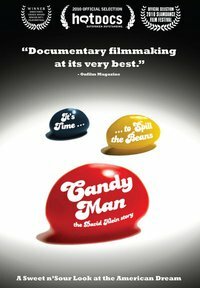 This is a documentary on the inventor of Jelly Belly Mr. David Klein who dressed as the Candyman and tossed his beans to audience members as he ran through. David was successful and eventually signed over his trademark to another company. It turned out to be a big mistake. We are all familiar with the brand Jelly Belly Jellybeans. David Klein is a colorful personality who has been in the candy business for ages although he starts the film saying he sometimes wishes he hadn't come up with Jelly Belly because they ruined his life. David before becoming a candy guy was going to be a lawyer so it is hard to know why he sold. He hadn't wanted to but did anyway and never came up with the next great idea. It's kind of sad. David is very interesting. He has a love of paper plates. He actually has a paper plate collection. Hmmmmm. Sandy Candy Factory in California which is David's current business and have to say I love all the candy listed on the site. I feel bad that David's big invention appears to have been sold from underneath him or maybe that is just because he comes off as a sad sack who lost his business to a big company. My favorite parts were watching Henry Winkler and Mr. Gum Drop on the Mike Douglas show.